Growing up in Dundee, AL Kennedy remembers a grey landscape with few creative outlets. Now the V&A has arrived, she heads home to check out the changes in the city. AL Kennedy grew up in Dundee in the 1970s and remembers a litany of industrial decline, council corruption and dodgy developments. So when she heard the V&A was coming to the city, she couldn't help feeling sceptical. 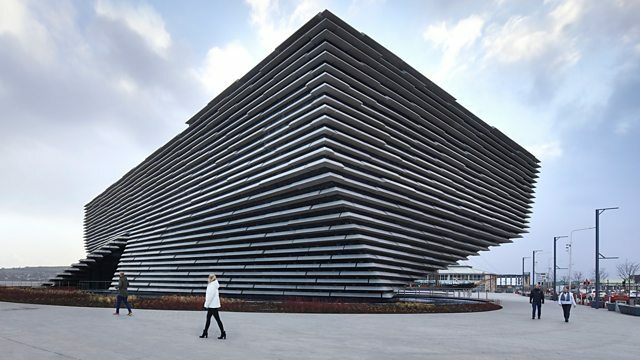 Returning to her home town today she discovers a dramatic transformation along the waterfront with the new V&A Dundee, Scotland's first design museum, providing a beautiful new public space. ALK can hardly believe her eyes. Traditionally, Dundee is not a city that shouts about its achievements, struggling to have its voice heard over the din of looms in the jute mills and more widely eclipsed in favour of Glasgow's patter and Edinburgh's prim posh. Now though, there's a new confidence in Dundee's creative community, with writers celebrating its distinct dialect, street art cropping up in hidden corners and a vibrant music scene has grown from the town's folk heritage. It's also high time everyone knew that design triumphs from The Beano to Grand Theft Auto were made in Dundee. The question is, will all this creative capital have a tangible, positive impact on the citizens of Dundee. AL Kennedy visits Art Angel, where people experiencing mental health issues create art, and finds that for some, art provides the most valuable lifeline. It remains to be seen if the cultural regeneration of Dundee will have the same effect.